Just Updated! Over 3000 trade name, chemical, and material fillers/extenders/diluents are described! What fillers what fillers are safe to use in tablets and capsules for pharmaceuticals? What fillers are available for a tire application? What extenders are suitable for a specific paint or coating application? What diluents will satisfy requirements for an adhesive formulation? This is the first update of this important reference in nine years. It describes more than 3000 trade names, generic chemicals, and materials that serve the dual functions of lowering the overall cost and improving the effectiveness of the end products to which they are added. The distinction between fillers, extenders, and diluents varies from industry to industry In the paper industry they are used to improve brightness, increase opacity, and reduce porosity. In paints, often referred to as inerts, extenders, and supplemental pigments, they are used to increase color, hiding power, weatherability and control viscosity. Fillers in plastics and polymers impart impact strength, lubricity, electrical and thermal properties. Diluents, besides supplying bulk to detergents, cosmetics, and pharmaceuticals, act to adjust dose or concentration. In general, they share essential commercial functions— increasing the bulk weight of products, diluting expensive materials, and/or acting as delivery systems for active ingredients. This group of products, therefore, is treated in this single reference source. This section provides an alphabetical listing of more than 2200 trade name chemicals/materials used as fillers, extenders, and diluents. Each entry includes the manufacturer's name; chemical/material description; its detailed functions and applications in all aspects of industry; physical properties, such as form, molecular weight, density, solubility, boiling point, cloud point, flash point, pH, freezing point, activity; toxicology, storage, precautions, etc. Keyword Indexes: Comprehensive Index, Trade Name X-Ref, Generic Chemical X-Ref, Manufacturers X-Ref, CAS X-Ref, EINECS/ELINCS X-Ref, Functional/Applications X-Ref., Environmental X-Ref., Toxicity and Precautions X-Ref. 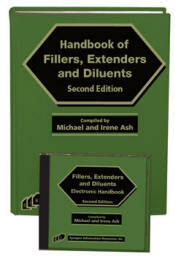 This section covers more than 650 chemicals/materials used as fillers, extenders, and diluents. Each entry contains information including the following: CAS (Chemical Abstract Service), EINECS/ELINCS (European Inventory of Existing Commercial Chemical Substances/European List of Notified Chemical Substances), and UN/DOT reference numbers, classification, definition, chemical synonyms, empirical and molecular formulas, properties, toxicology, precautions, storage, uses, use level, regulatory details, manufacturers and distributors. All chemical/material synonyms are cross-referenced back to the main entry. These entries are followed by a listing of the trade name products that are either equivalent to the monograph entry or contain it as one or more of its ingredients. This section, with more than 4,100 categories, is a powerful tool for locating materials based on their function and/or industrial application area. By searching for key functional words such as filler, reinforcement, diluent, bulking agents, extender, etc., combined with a specific application area, such as polystyrene, tires, cosmetics, coatings, etc., the user is directed to the trade names and/or chemicals and materials that have that specific functional/application attribute. The generic component names are distinguished from the trade names by italic type.